Tiny cups and cutlery can make us feel like giants. They can also help with portion control (until you realize you’re just refilling a small bowl with scoop after scoop of ice cream). But sometimes the reason for the smallness isn’t quite apparent. Take the Port glass. 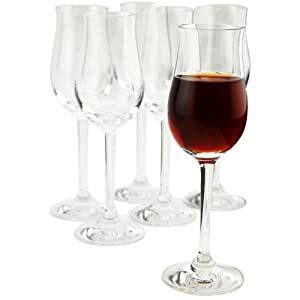 Typically, when you’re served port at a bar or restaurant, it’ll come in something that looks like this: moderately long stem leading up to a small cup. The shape of the cup can vary, of course. Some are tulip-shaped, like these, some are straight-edged, and some are made to look like little glass cats (we think?). Based on all we’ve been told about aromatics and wine (and whiskey, and even beer), you might conclude the smaller glass has something to do with concentrating aromatics—kind of the way a Glencairn does for Scotch. And that idea might hold some water, so to speak, since port is a fortified wine, made with aromatic grapes like Touriga Francesca and Tinta Roriz . 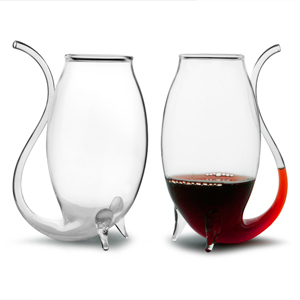 Natural body heat from your hand holding the glass, and more volatile alcohol to lift up aromatics (meaning a giant red wine goblet won’t be as necessary), the smaller glass might just present the port at its best. And then there’s another, and super simple, explanation for why Port glasses are typically small. Port is stronger than regular wine—clocking in at 20% ABV. A smaller glass is meant to accommodate the smaller pour you’d take. Between that higher ABV and concentrated aromatics, it makes sense to pour your port into that tiny glass. Which isn’t to say a regular, even large, wine glass wouldn’t do. Just pour in moderation, swirl that port around to release its aromas, and dive in to some liquid relaxation.